There are two ways to look at what Sen. Robert C. Byrd, the longest-serving U.S. senator in history, has meant to the people and the place that sent him to Washington for 57 years in a row. Outside critics like Citizens Against Government Waste crowned him the "King of Pork," dismissing the billions of federal dollars he sent to West Virginia as worthless "Byrd Droppings." But back in Charleston, a grateful legislature crafted a fitting description for the Democrat who dedicated his life to representing his state's people in Washington: They had his likeness cast in larger-than-life bronze for the first and only statue in the history of the state Capitol, and mounted it on a pedestal declaring him "West Virginian of the 20th Century." Any other place, that might sound like hyperbole. But ask West Virginians to name someone else who has done more for the 1.8 million who live here, and there is usually silence. "No one man that I know of," said Floyd Sturm, an 84-year-old retired train conductor from Grafton. "We wouldn't have some roads. We wouldn't have some schools. ... He's left his mark all over everything. "You take those things away, imagine ... " he said, falling quiet. "It would be blank." At least 40 contributions bear their benefactor's name, from the Robert C. Byrd Regional Training Center for soldiers at Camp Dawson in Kingwood and Robert C. Byrd High School in Clarksburg, to the 17-mile, four-lane Robert C. Byrd Drive near his hometown of Sophia. 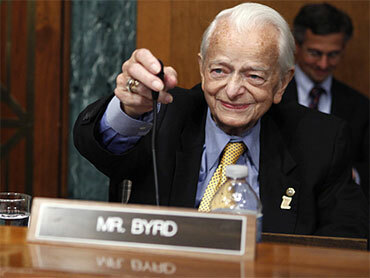 "When you think of Senator Byrd, you think of West Virginia. Period," said Laura Blosser, a 45-year-old transport manager for Ruby Memorial Hospital in Morgantown. "When you travel through the state, you see his name everywhere from the north to the south." He was, says fellow Democrat and Congressman Nick J. Rahall, "simply irreplaceable." Byrd's long-held grip on the Senate Appropriations Committee helped fund scholarships and schools, federal courthouses and prisons, even a massive radio telescope in Green Bank that tracks pulsar waves that have traveled through space for billions of years. He made sure plenty of federal complexes were built in West Virginia, including the FBI's fingerprint repository in Clarksburg, the Coast Guard's National Maritime Center in landlocked Kearneysville, and a training center and firing range near Harpers Ferry for customs and border protection officers. "If it's here, he brought it," said 54-year-old Jackie Crites of Westover. "Without him, I think we probably would be a little bit farther back in the Dark Ages." Critics are just jealous they weren't getting the money, said Anthony Raddish, a 54-year-old electrician from Farmington who met Byrd when he was 6 at a United Mine Workers event. "He finally got in a position where he could actually help the people that he was representing. Now as a senator in his position, why wouldn't you?" said Raddish, standing outside the Robert C. Byrd Health Sciences Center at West Virginia University in Morgantown. "Whoever was in there before, they did the same thing he did," Raddish said. "As far as we're concerned, we just got our share, finally." From his first race for the state House of Delegates in 1946, Byrd never lost an election in West Virginia. After two terms there and one in the state Senate, he was elected to the U.S. House in 1952 for three terms before winning his Senate seat in 1958. He carried all 55 counties in four of his nine Senate bids. Exit polls in 2006 showed his support still cut across all demographics, regardless of age, income or education. But Byrd's record-setting political career also had its low points. He aided the unsuccessful filibuster of the 1964 Civil Rights Act with a 14-hour speech that ranks among the longest in Senate history. And though it never hurt him back home, a more enduring scandal was his membership in the Ku Klux Klan while in his 20s - a brief affiliation for which he repeatedly apologized. "He dealt with it well and admirably. He matured. He admitted he made a mistake," said Kenneth Hale, president of the state NAACP. "There was change coming, and he got on the right train." West Virginians focused on things they appreciated: His nearly 70-year devotion to late wife Erma. His early, everyman careers as a butcher, a salesman and a welder. His ability to point people out in a crowd and remember their names. His good-as-a-contract handshake. "He talks, and he don't promise you a bunch of roses. He tells you, 'This is the way I see it,' " said Republican Donald Boylen, a 70-year-old retired coal miner from Philippi, who credits Byrd for his health benefits. "You get a lot of people who promise you a bucket of roses and they give you a bucket of ... something else," Boylen said with a chuckle. "I think that's the way he was brought up, to care for people. You can't say enough about the man, really." Byrd found new fans across the country when he opposed the war in Iraq and challenged the policies of then President George W. Bush in his best-selling 2004 book, "Losing America: Confronting a Reckless and Arrogant Presidency." But his steady contributions to prosperity are what endeared him to most at home. Byrd joked about his largesse at the dedication of the Robert C. Byrd Biotechnology Science Center at Marshall University in 2005, saying he'd rolled up his shirtsleeves and gone to work for the required funding. "Yeah, man," he told the crowd, "you're looking at Big Daddy!" And pork is in the eye of the beholder. "In general, I'm not a fan of pork barrel spending," said Tim Joseph, a 38-year-old information systems professor at Fairmont State University. "But all the projects that I know of have had a great, direct positive impact on West Virginia -the FBI complex, the NASA facility, other things in various parts of the state." West Virginia's longest-serving House of Delegates member, Republican John Overington of Berkeley County, got into politics to fight the "Big Daddy" approach and to push for balanced budget amendments that Byrd opposed. While some of the federal funding earmarked for West Virginia has improved its infrastructure, Overington questioned the cost. "I don't agree with that particular approach, and I think it's caused something of a dependency to develop," he said. "He has done everything he can for West Virginia. That has sometimes conflicted with the national interest, and the deficit spending is an example of that." According to Citizens Against Government Waste, Byrd directed $3.3 billion in pork to West Virginia between 1991 and 2008. Byrd, however, has neither regretted nor apologized for his efforts. In his autobiography, "Robert C. Byrd: Child of the Appalachian Coalfields," he wrote that he was proud of supporting a state that suffered more than most through recessions, a state long exploited for its natural resources and slow to attain prosperity. "I came from lowly beginnings. The bottom rungs of my ladder were gone," he wrote. "I had to have the help of the good Lord, and I've had to have the help of the people and the confidence of the people. And I've tried to repay them." Associated Press writer Lawrence Messina in Charleston contributed to this report.